One of many skills that young children begin to develop as they go through preschool and kindergarten is tolerance for delayed gratification. They practice patience. That may be the most immediate lesson offered by an unassuming sapling planted recently on the front lawn at Hanna Perkins School. But some day, probably at about the time this year’s kindergarteners are stressing over college applications, the new sugar maple will become a teaching tree – revisiting a Hanna Perkins tradition of collecting sap to produce maple syrup. The practice took root in 1991, when the school was located at its old location in University Circle. That was the year Dr. Robert Furman retired from his longtime role as director of the school, and to mark the occasion he donated a sugar maple from family property in Geauga County. It was replanted on the school playground. By February 1998 it had grown large enough to tap, and Dr. Furman – still visiting classes weekly as Director Emeritus – led the kindergarten students in tapping the tree and hanging a bucket to collect its sap. Tapping is done in late winter, when days are above freezing and nights are below freezing. The activity teaches students the source for real maple syrup. They learn that the tree has sap, which contains sugar. They may be able to comprehend that trees store this sugar for their own food, and that trees have a way of transporting the sap. Through tapping the maple, children are supported in observing and inquiring about their natural environment. In kindergarten, they are ready to learn about the natural history of maple sugaring, which integrates science and social studies. Preschool children watched the action through their classroom windows – knowing they would get a closer look later, when it was their turn to go outside to play. Some would stick their fingers under the tap to taste the sap as it oozed from the tree – learning, perhaps, that sap isn’t the same as syrup. “It was as though the children couldn’t wait to get to kindergarten to have the actual experience,” recalls Karen Goulandris, who was a Hanna Perkins teacher at the time. 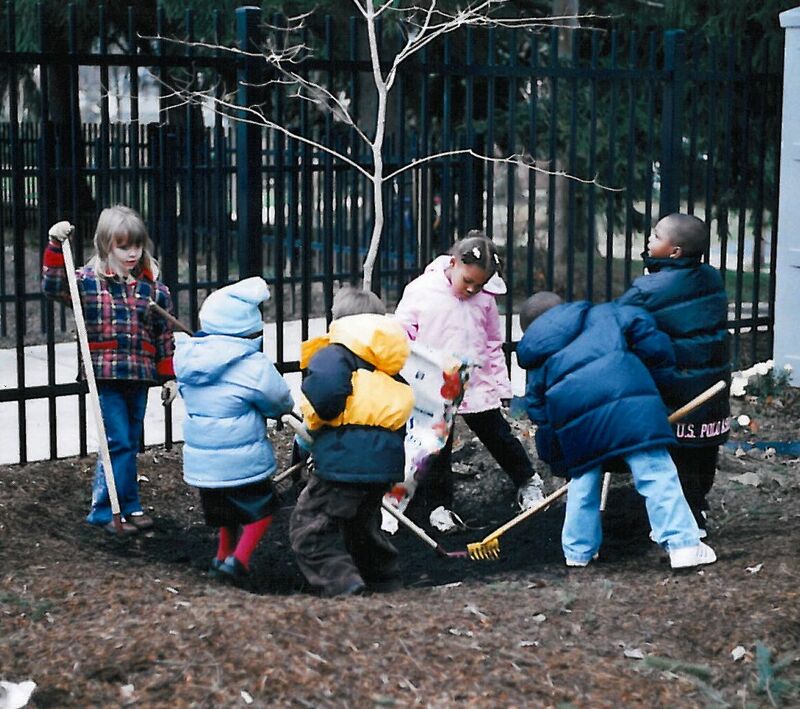 Children in the toddler groups also noticed something special was happening, and would go with their teachers during scheduled outdoor time to investigate. Mrs. Erna Furman – Dr. Furman’s wife, herself a noted child psychoanalyst who was deeply involved the school – taught the teachers how to boil the sap, and consulted with them when things got sticky. Hanna Perkins opened at its current location in 2003 – just months after Erna and then Robert Furman died. In their memory, another maple tree was moved from their rural property to the new Hanna Perkins school. 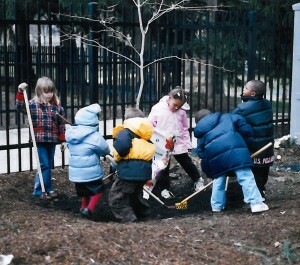 It was planted in the preschool playground, in a hole that had been prepared by some of the kindergarten students. Only now is it growing large enough to tap. In the intervening years, Dr. Lydia Furman – daughter of the Furmans and a Hanna Perkins trustee – has continued to provide sap to boil. Sugar maples are native to Northeast Ohio, but they aren’t readily available for purchase. Ardmore Tree Service located a sapling, transported and planted it – and in the end donated a portion of the cost, which is about twice that of faster growing varieties. The tree is located on Hanna Perkins’ front lawn – not far from where a mature oak was brought down by a severe storm in 2012. It is being watered daily in a shared effort by members of the Hanna Perkins administration and staff. Its trunk needs to reach a diameter of 10-12 inches before being tapped. By any estimate, that will take at least a decade. Until then, in early spring, the school will boil sap donated from other sources. And everybody will practice patience. Thank you for sharing the story about why HPS cares so much about maple syrup. I enjoyed reading it and recalling the fun times!